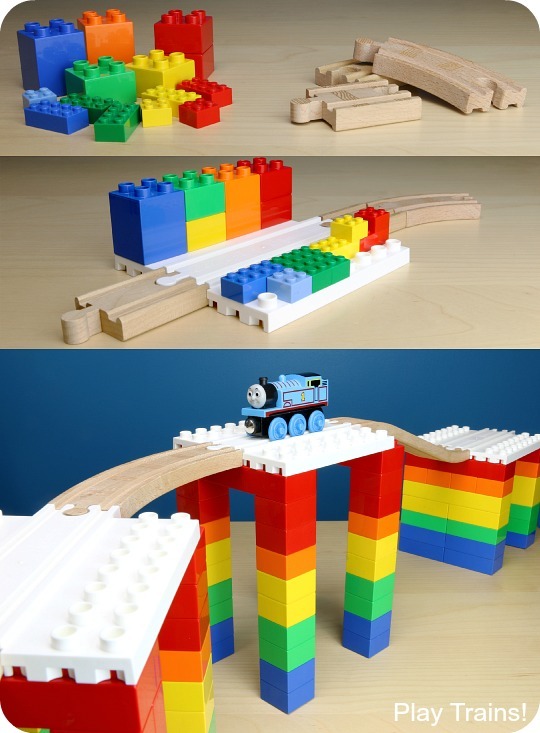 If your child has ever wanted to be able to combine DUPLO or LEGO blocks with wooden train tracks, good news: there’s a new product designed to connect tracks and bricks. 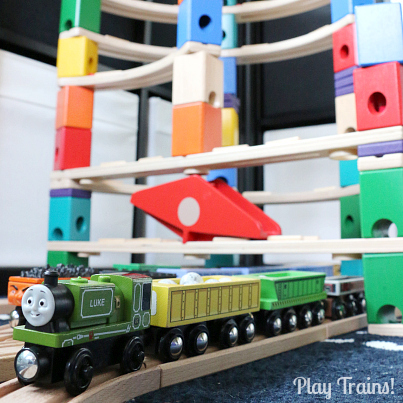 Dreamup Toys sent us some of their Wooden Railway Block Platforms to test out, and I’m extremely happy to report that they do exactly what they’re supposed to do: inspire kids to build something new with two of their favorite toys. 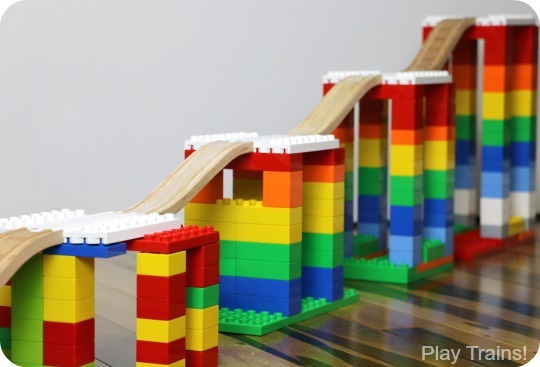 In this post, I’m going to show you how they work and give you some tips on building with them, but you can also see what the Little Engineer was inspired to build…at least, the first few things, because he’s built many more things since then! You could call this a parents’ guide to building with the block platforms, both because it will give you a head start on some handy information and because kids don’t need a guide. 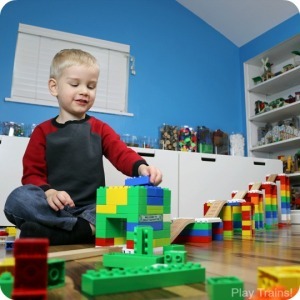 Once my son got his hands on his first block platform, he was engrossed in experimenting with it and figuring it out all on his own. 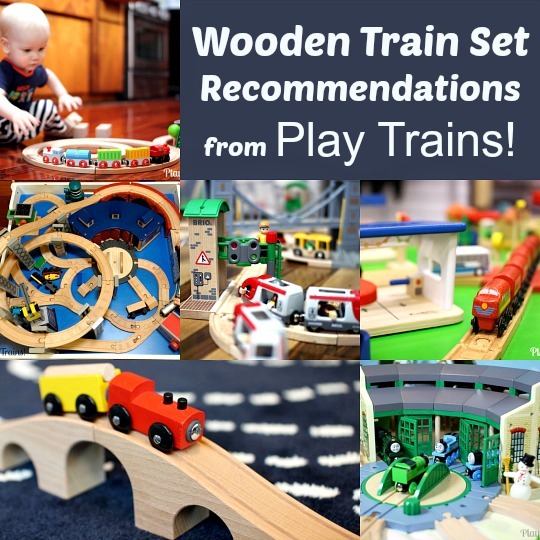 We received samples of Dreamup Toys’ wooden railway block platforms in exchange for an honest review of the product. This post contains links to Amazon.com. If you click on one, we will receive a small commission — at no additional cost to you — on anything you buy at Amazon for a certain length of time afterwards. Read our disclosure policy for more details. I’m going to pass on as many tips as I can for making the most of the block platforms, but remember it’s best to just let your children play with the platforms, tracks, and blocks. 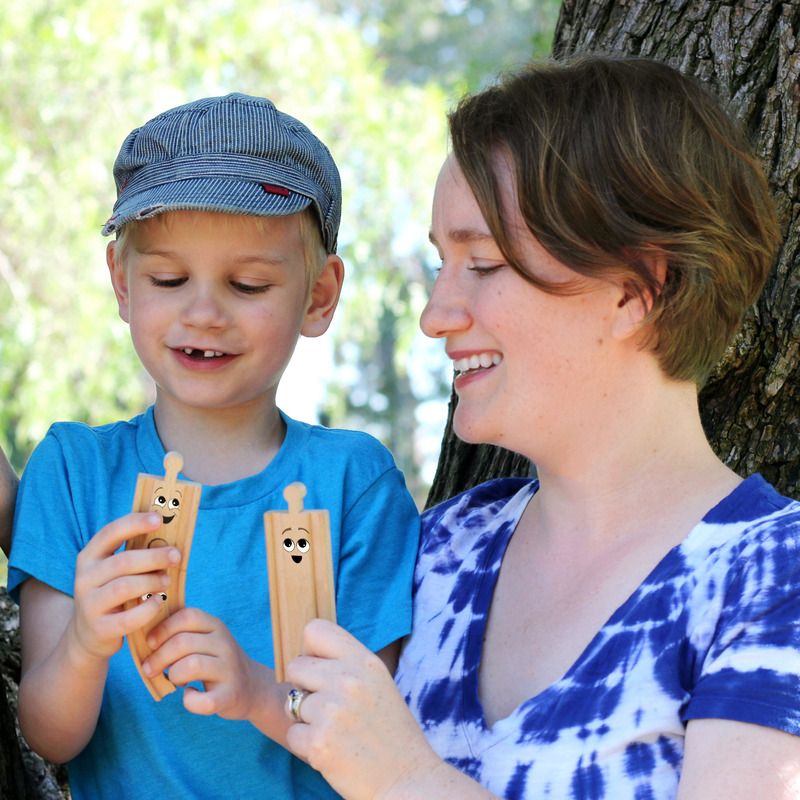 They will discover their own ways of building with them through trial, error, and imagination. My son’s structures were very different from mine, but they worked just as well, and he learned so much more from creating his own designs than he would from having me teach him the “best” way to support the platforms. 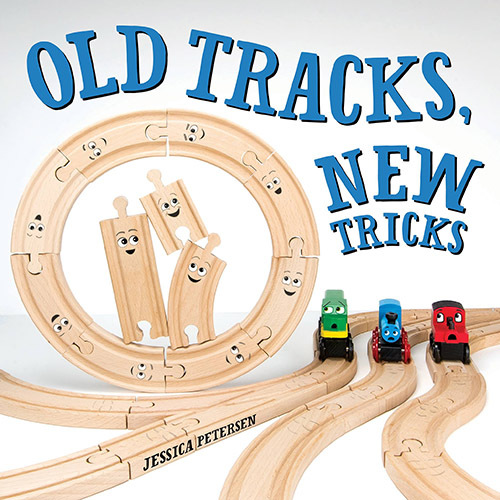 Take it out, and you have the equivalent of an 8×8 stud DUPLO plate, with a wooden train-style track running down the center. 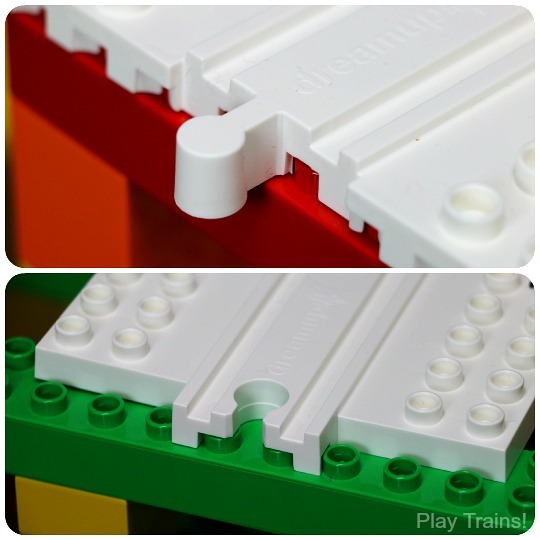 The surface of the plastic has some texture, rather than being shiny and smooth like DUPLO blocks. 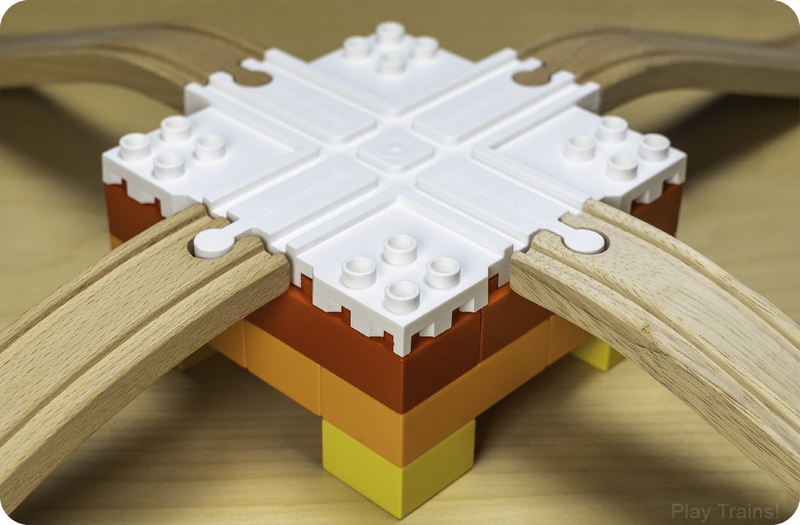 Notice the holes in the center of each of the studs on the top: those are what allow regular-sized LEGO (or LEGO-compatible) bricks to fit on top of the platforms as well as DUPLO (or DUPLO-compatible) blocks. 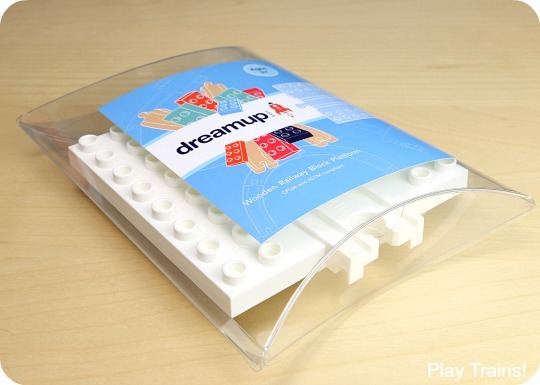 This year, Dreamup Toys has added a new cross block platform to their lineup. We were so excited when they sent us a 2-pack of them to try out! 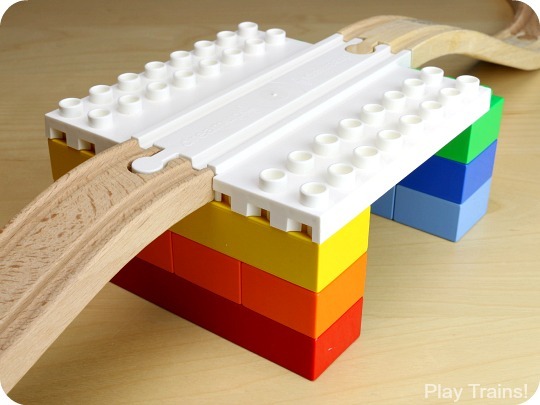 While these cross platforms fewer DUPLO-style studs for building on, they allow you to cross two tracks over the platform, adding variety to the wooden train layouts you’re able to build. …or with LEGO bricks. 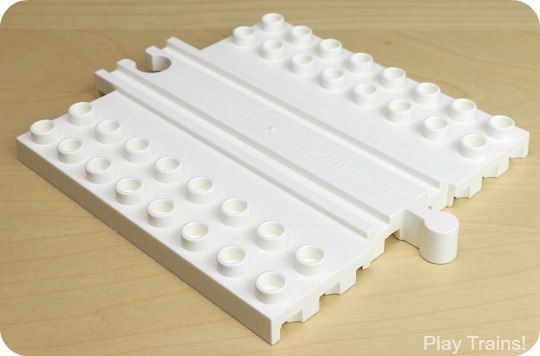 LEGO bricks you attach directly to the platforms need to be actual bricks rather than the flat plates, and they have to have studs in multiples of two in both directions. We mostly used 2×4 and 2×2 stud bricks. We also found that the regular LEGO bricks didn’t always cling very strongly to the platforms, but they do go on. Strangely, this is one time when K’nex’s LEGO-compatible building blocks worked better for me than the real LEGO bricks, holding onto the platform’s studs relatively tightly. The other thing to note about regular LEGO bricks is that they can only build on top of the platforms, not beneath them. At least, I couldn’t find a position where they could attach onto the underside of a platform. Next, you can raise the platform up with blocks beneath it and connect ascending wooden train tracks. 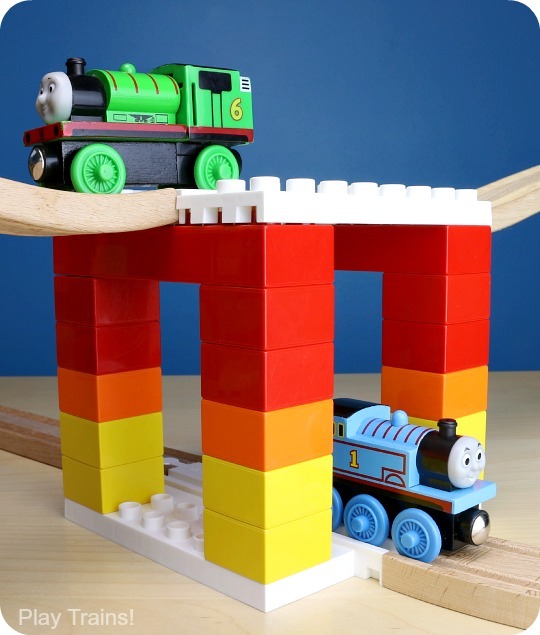 As I explain in our Guide to Wooden Train Bridges and Elevated Tracks, many raised elements are not sturdy enough and fall down easily during normal train play, but once you build supports under these platforms that work, they stand up to play extremely well. The ascending tracks need to be supported by blocks directly beneath where the tracks connect to the platforms. After some experimenting, I found that the best way to support the tracks depended on which end of the platform I was connecting up to. On the peg end, you can’t attach blocks sticking out past the edge of the platform. The peg doesn’t fit into them. So the supporting blocks beneath the platform must be flush with its edge. You can see how the platform cuts in just a bit where the track connects, so that there’s a little ledge for the track to rest on. So far, this has been plenty to support the track. On the hole end, the blocks can stick out one row beyond the platform (any more than that would get in the way of any track connecting to it). 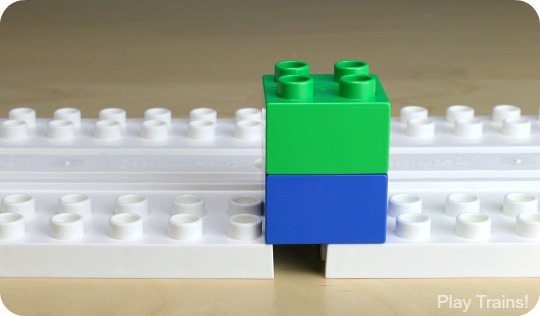 As you can see, the peg on the end of a piece of track would fit nicely between the studs on the DUPLO block. If you have more than one platform, you can build elevated sections of track between them, or raise the track up, stair-step style, for a super long slope. 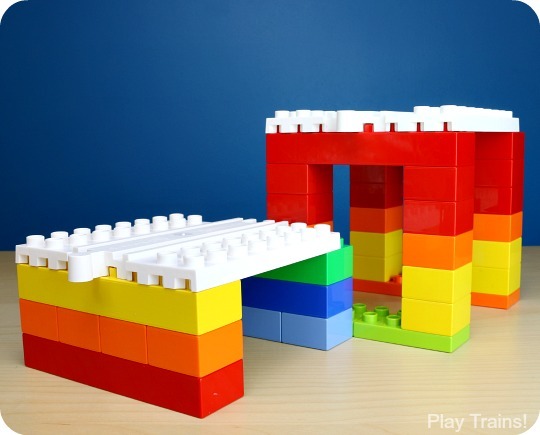 If you have any DUPLO windows, these can help build the really tall platforms faster, given that every regular DUPLO window is as tall as three blocks. We also have some extra large DUPLO windows/doors that are five blocks tall. 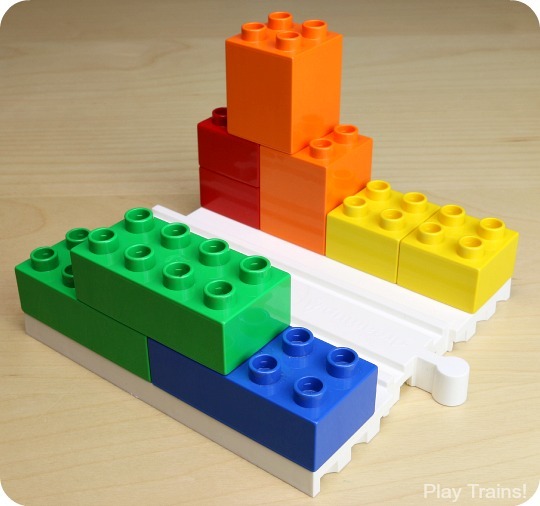 Or you can build directly on top of another platform, which are half-height just like the DUPLO plates. When building steep slopes like the one below, it’s important to get the alignment of the tracks as straight as possible. If it’s not straight, the trains will crash or derail when they get to a crooked track connection. I showed the Little Engineer how to stand with one foot on either side of the track and then look down the line of the slope to see where it needed to be fixed. And it pretty much needed fixing after every run down the slope, because the DUPLO blocks slid around on our wood floors. If you want to avoid straightening the tracks and platforms, you can do what I eventually did: build them on top of DUPLO plates linked together with more plates and blocks, so that the platforms are locked together in one big structure. This worked most of the time, though I did come to a couple of platforms where the space between them was just a little off and I couldn’t connect them. I’m not sure if that was because of the particular length of ascending track I used (each brand’s track is a little different) or what, but the rest of them worked well for me. You can also connect the block platforms to each other. The one tricky thing about this is you can’t build a structure that spans more than one platform. As you can see in the next photo, it just doesn’t line up that way. However, you can link them up and build separately on each platform. 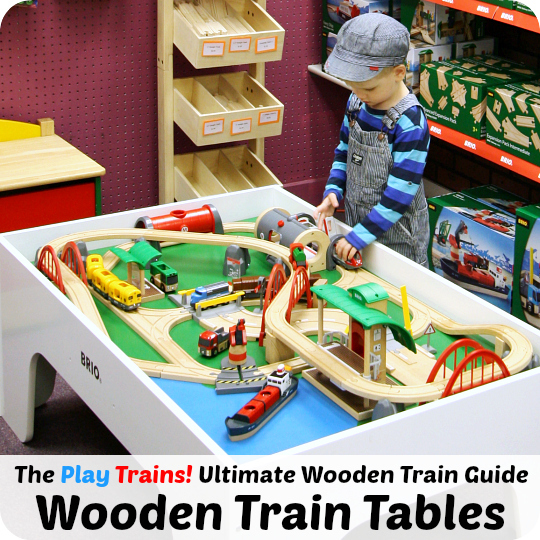 You can buy the wooden railway block platforms directly from the Dreamup Toys website. Note that international shipping is available: just email [email protected] with the quantity of block platforms you wish to purchase and your address, and you’ll be emailed an invoice. LEGO DUPLO Creative Play All-in-One-Box-of-Fun: This small set would be great to go with one or two building platforms, and it does come with a few windows and building plates. LEGO Education DUPLO Brick Set (144 pieces): This is a pretty good deal for the price, and the set seems to include a number of building plates. 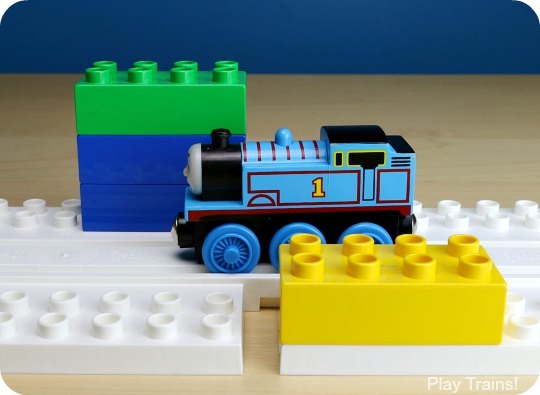 LEGO DUPLO Building Plates (3 large plates): This is a good pack of three large building plates (the type that can be put on top of other DUPLO blocks, rather than the extra flat ones that stay on the floor or table). Unfortunately, this set seems to have been retired, which means the price has gone up, and I can’t find a replacement product for it. But if you can find them for a reasonable price, these are great, and would be very useful for building multiple and tall platforms. LEGO DUPLO My First Number Train: This is a fun train set on it’s own (and a good way to get wheel bases to make other DUPLO trains for a reasonable price). 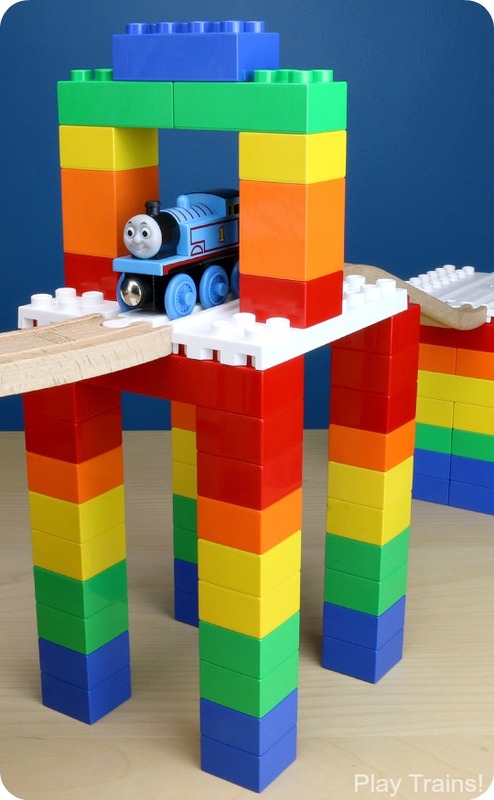 The tall number blocks are great for building tall supports for the platforms. LEGO Education DUPLO Tubes Experiment Set: This is a crazy cool set that comes with big building plates and some huge windows/doors (the equivalent of five blocks tall) that would be especially helpful if you want to build very tall platforms for your train tracks. I bought it for my son when he desperately wanted — but was way too young for — a marble run, and we’ve had a lot of fun inventing things with the pieces ever since. 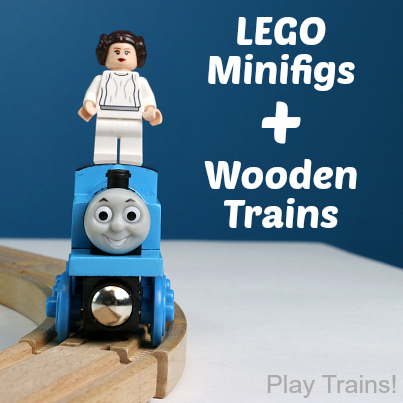 I can’t wait to try combining the tubes with the block platforms and our wooden trains! LEGO Education DUPLO Town Set (223 pieces): This is another LEGO Education DUPLO set I bought to kickstart our DUPLO collection when the Little Engineer was ready to build with them. (At the time, it was the only way to get so many wheel bases so we could build trains!) The set comes with a ton of blocks and windows that you could use to build below and above the block platforms, and I think it comes with some small building plates, though it’s hard to tell from the only pictures I can find of it (my memory is even worse than the pictures!). 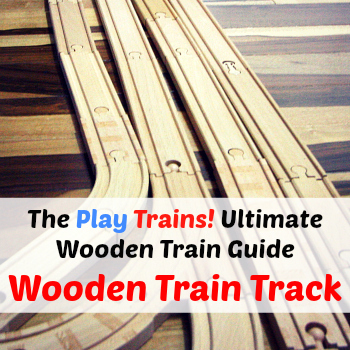 You can check out the Wooden Train Tracks section of our Ultimate Guide to Wooden Trains for lots of wooden train track information and recommendations. However, what you’re most likely to need to go with the platforms is ascending wooden train tracks. 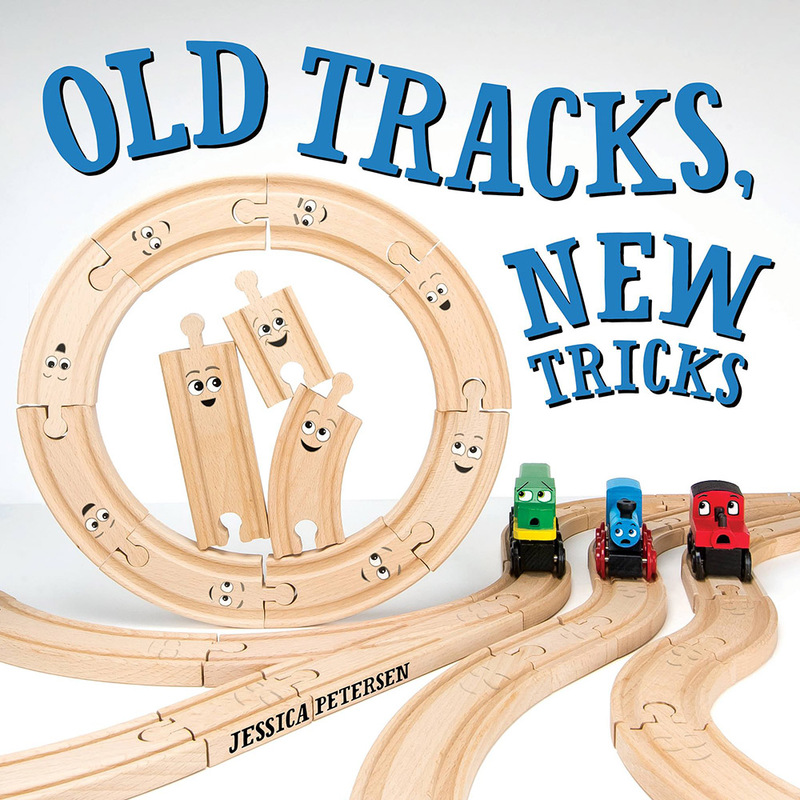 You’ve read my adult’s guide — now see all the fun my five-year-old son had with the wooden railway block platforms! There’s even a video of him demonstrating one of his inventions. 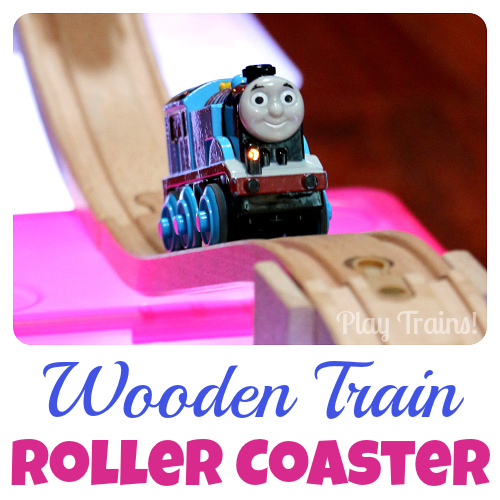 These really are an incredible addition to the toy box of any child who loves wooden trains. The Little Engineer has been inspired to build and build and play the most amazing things all week long! These are all so incredible! What a brilliant design, and I love your photos. The rainbow tower is awesome! Thanks, Katie! I had so much fun building rainbows with the platforms. 🙂 And yes, they are completely and totally brilliant. We keep coming up with more things to do with them! 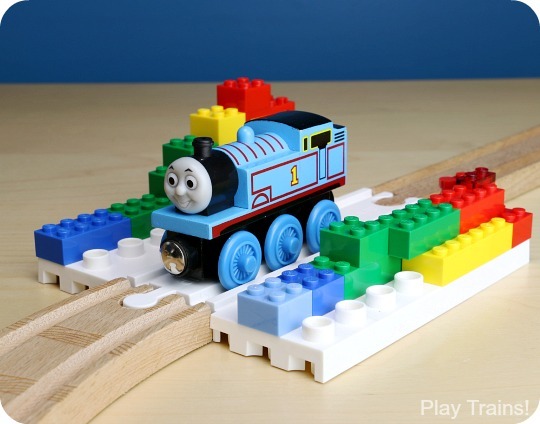 What type of tracks are used that fit Thomas Take and Play trains? Thank you! Thomas Take’n’Play trains have their own special grey plastic Take’n’Play track. Take’n’Play trains are sadly not compatible with wooden train tracks because the space between their wheels is too narrow.